Silky smooth hair is the ultimate achievement for your hair! 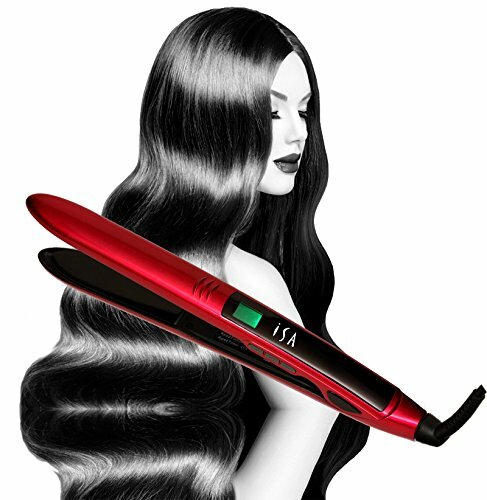 You won't believe how silky smooth your hair will be after using our revolutionary MIRROR Titanium flat iron. Digital temperature control makes sure the temperature is set precisely for YOUR hair. Temperature will be displayed precisely for maximum results! Give your hair the quality it deserves with ISA Professional products. Comes in a semi-gloss recyclable white gift box. Full 2 Year Warranty. The flat iron hair straightener should be used after hair is washed, dried, and brushed. When used properly, ie perpendicular to hair and not parallel to hair, there is no hair pulling or breakage. The key elements of proper flat iron straightening with this appliance are: proper preparation of hair with drying and brushing, perpendicular use, slow controlled movements, and not trying to do too large a section of hair each time. The arc shaped tip of this straightener should only be used on short hair/bangs, while the body of the straightener should be used for all other hair - ie. medium and long length. For straightening, flat ironing, curling hair. If you have any questions about this product by ISA Professional, contact us by completing and submitting the form below. If you are looking for a specif part number, please include it with your message.